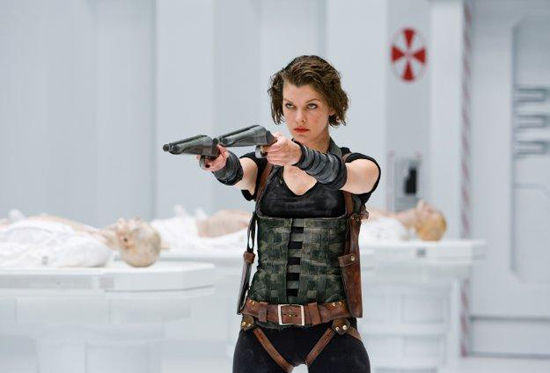 'RESIDENT EVIL: RETRIBUTION' Will Begin Shooting This Fall! Resident Evil: Retribution is slated to begin principle photography this fall. Bloody Disgusting brings forth the word that zombie slayer 'Alice' [Milla Jovovich] will shoot on location in both Toronto and Japan. Jovovich is not yet confirmed to reprise her role, but since her husband is scripting the project [Paul W.S. Anderson] I am sure its pretty likely. Sienna Guillory aka 'Jill Valentine' in the franchise is the only cast member confirmed to return. No plot details are yet known. Sony Screen Gems is planning to release the film in theaters on September 14th 2012. Happy birthday to me. The last offering in the series, Resident Evil: Afterlife, grossed nearly $300 million worldwide & $60 million domestic. I'm reading: 'RESIDENT EVIL: RETRIBUTION' Will Begin Shooting This Fall!Tweet this!